1 : 6000 Bromley, George Washington; Bromley, Walter Scott; G.W. Bromley & Co.
North Tarrytown and Tarrytown, Westchester County, New York. (inset) Glenville. 1 : 3960 Beers, J.B.
1 : 7200 G.W. Bromley & Co.
1 : 3000 Bromley, George Washington; Bromley, Walter Scott; G.W. Bromley & Co.
146-147 N. Tarrytown, Mt. Pleasant. Tarrytown Cemetery at Sleepy Hollow, West-Chester County, N.Y. / laid out by James E. Serrell, city surveyor. Plates 42 & 43: Tarrytown Heights Land Company, Plan of the Land, belonging to the Company. from County atlas of Westchester, New York. Published by J.B. Beers & Co., assisted by S.W. Wilson and others. Plan of Beekmantown, Tarrytown and Irving, Westchester County, New York. 1 : 3960 Beers, Frederick W.
152-153 N. Tarrytown, Mt. Pleasant. 1 : 4500 G.W. 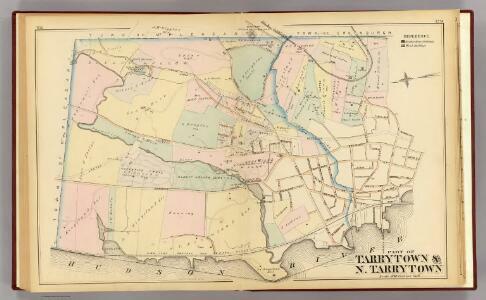 Bromley & Co.
Plan of Tarrytown, North Tarrytown, and Surroundings. from Atlas of the Hudson River Valley from New York city to Troy, including a section of about 8 miles in width. Published by Watson & co. Compiled from official records and careful surveys, under the supervision of F. W. Beers. Portion of Rockland County. ; Portion of Westchester County. 1 : 5900 Bromley, George Washington; Bromley, Walter Scott; G.W. Bromley & Co.
1 : 9600 G.W. Bromley & Co. Publisher: Bromley, George Washington; Bromley, Walter Scott; G.W. Bromley & Co.